We were very surprised by the marquee results of a TrustRadius survey on Conversion Rate Optimization. While 72% of the companies surveyed have implemented some CRO processes, only 18% of them consider CRO as “Part of their DNA”. We would speculate that many of these 18% of companies are in very competitive commodity industries, such as travel, office supplies, and pet apparel. In other words, they had to optimize or die. These aren’t the only industries in dire need of optimization, however. 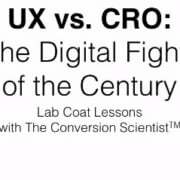 While CRO isn’t a zero-sum game, you do not want to find yourself playing catch-up with your competitors. As this survey shows, CRO is a key competitive advantage online, just as SEO has been. TrustRadius is in a unique position to conducted a survey of businesses. They offer some of the most helpful reviews of business software on the Web, and were able to get 4100 companies to complete the survey. This is statistically significant stuff. Here are some of the highlights from their survey. 58% of companies spend more than $10,000 per year on digital analytics, while 44% spend that much per year on A/B testing tools. 59% of companies have plans to spend more this year than in the previous year on digital analytics tools, but only 48% plan to increase spending on A/B testing tools. Download the TrustRadius Buyers Guide to see what they are spending that money on. The vast majority of companies (91%) use between two and ten digital analytics tools regularly. Check out the full report now and then give Conversion Sciences a call to see what you can do to inject CRO into your DNA. As Conversion Scientists, we obviously eat this stuff for breakfast. We’ll show you how much money you could be making with our 120-day Conversion Catalyst™ program. It’s free, and it’s invaluable. Jump on a call with us at (888) 961-6604. You’ll be glad you did.